Before going *any* further with VSTO code, I am taking some very good advice I gave myself a couple of years ago and installing some of the VSTO Power Tools (just the VSTO_PT.exe package) – specifically to obtain the VSTO Developer Cleaner and the VSTO Troubleshooter. I recall both of these being very helpful, the last time I went down this path. “You are correct in that the User Guide does not explicitly state that you cannot use VSTO_PTExtLibs.exe to redistribute the extension assemblies, but as you found, the installer has a dependency check which prevents it from being used for that purpose. Heh, yeah right. A year or two ago I feel down the rabbit hole of developing a custom setup package for a Word VSTO app add-in. That sucked me dry for months, and I never got any satisfaction out of it (tho it’ll probably save me a couple of months this time around). *Voluntarily* adding to my pain by trying to install a helper assembly of dubious provenance and poor support? Not bloody likely my friends. …actually, I just remembered how many articles I’ve been skimming are focused so strongly on .NET Framework 4, so first I decided to re-target the VSTO project to .NET 4. For some reason that seems to have wiped out the piece of code that contained the ElementHost-including form, so perhaps that’ll clear up the problem I’ve been having. I ended up Building the project and failing, needing to add a Reference to System.Xaml (from the .NET 4 namepsace) to one of the .CS files. Once I did that, magically I was able to add either of the XAML user controls I’d tried to create as children of the ElementHost object. Amazing. 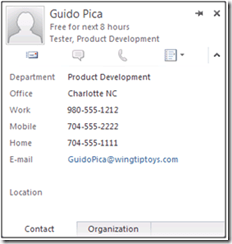 I’m re-trying this approach with an Office Ribbon (XML) item as is outlined in Customizing the Context Menu of a Contact Card in Outlook 2010. I change the button element’s id, label, and onAction XML parameters, then run this article’s VB-only code through a VB-to-C# converter to import into my code. Each time I have to fill in a few blanks along the way – figuring out which method to add to my code, to which CS library, and matching some undeclared variable names and using statements up with orphaned code in the sample. What moron would expect a “Visual How To” from Microsoft to ever run without a ton of band-aid work to actually fill in boring-but-essential components? creating the Callback Methods that are hinted at (but not spelled out) in the Ribbon (XML) //TODO section (automatically generated by Visual Studio when I created the Ribbon (XML) object. Yeah, that should be easy. Callbacks – is that like in the theatre? Hell, for all *I* know, (2) is where I *implement* (1). You must add onAction callback methods for the Insert Text and Insert Table buttons to perform actions when the user clicks them. Aside: the specific Context Menu I’m manipulating here is sometimes called the Persona Context Menu (at least by the article Extending the User Interface in Outlook 2010). I have a feeling that will be a very useful phrases in my current research. How Do I: Create a WPF Control for Use Within Outlook 2010? Building an Outlook Add-in: customizing the Contact Card, other options? Yes the question should be asked: are you better off writing an Outlook 2010 add-in using WPF or a Windows Forms? I haven’t yet found a definitive answer, and they may both be supported to some degree, but the majority of articles I stumbled across were using WPF not Windows Forms. That *may* just be a tyrannical bias coming from Microsoft, where XAML is all the rage and you’re ‘not allowed’ to talk about legacy development there anymore. Regardless, if I see WPF and Outlook 2010 mentioned more than a half-dozen times, that *has* to be supported pretty well, so I’ll go with that for now. It already has a tabbed interface, so adding another tab makes intuitive sense as a user. It’s the first interface you get to detailed info on a user, so it’s the fewest clicks to get to an extended UI I could add. So my next search – Outlook 2010 “contact card” “object model” – turned up an article called “Customizing the Context Menu of a Contact Card in Outlook 2010”. Among other things, this article states that “The IMsoContactCard object is defined in the primary interop assembly, Office.dll, of the Microsoft Office object library, not in Outlook 2010.” So this is apparently an Office-wide object, available to other Office apps – not just Outlook (though it’s entirely possible Outlook is the only app that bothered). Which also happens to lead to a Code Gallery sample called “Outlook 2010: Visual How Tos: Code Samples” that includes the sample code. Unfortuately the sample is adding a new entry to the context menu, not to the Contact Card itself (which is a mite confusing, as the object model doesn’t make a really clear distinction between the two). HOwever, this gives me a great lead on what area of the object model to focus my attention on. And worse come to worst, I can always start with a really crude hack of adding a context menu selection that just pulls up the internal directory data for the selected user (or as I’m seeing from the code sample, the “Recipient” – gotta get your nomenclature aligned when you dive into an Office object model exploration). And a search of MSDN Library for IMsoContactCard led to one non-reference article: Extending the User Interface in Outlook 2010. According to this article, adding a new item to the context menu when you right-click an email sender or recipient is done using the ContextMenuContactCardRecipient context menu. Add a right-click menu option that pulls the internal directory info for the selected recipient. Add another tab to the ‘legacy’ Outlook Properties window (which was the default in Outlook 2007 & 2003 when you double-click on a user). The programming for the Contact Card context menu was just added in 2010, which probably makes it behave more consistently and robustly than the COM-based crap that comes with legacy Outlook features. Adding a tab to the Properties window (form) would assist me more easily if I wanted to “crawl up the address book” (i.e. look for the same information on the managers of the recipient I’m exploring). I find I *can* get to a context menu for the recipient’s manager, but it’s hellishly buried and I’d probably be one of three people who’d find it (or who’d bother taking this path). From my recollection, Office (and Outlook in particular) can be really picky about exactly how and when to dispose of objects – generally resulting (from <100% perfect code) in deadlocks, memory leaks or difficulties in shutting down the hosting app. I would imagine the Interop Assemblies have a harder time communicating reliably with the legacy COM object model (e.g. Properties window) than with objects only recently introduced (e.g. Fluent UI). While the Office Interop Assemblies have been incredibly forgiving about providing backwards-compatibility to all the COM objects that have been accumulated over the decades, I have to believe that Fluent UI customizations have a better future in coming versions of Office than COM-based customizations. This should be especially true of Outlook, since that team took a “wait and see” approach to the Fluent UI in the Outlook 2007 generation. If they’re still on board, they’ve benefited from the delay *and* it is likely they’re more committed than if they’d gotten burned by jumping in early. If I’m reading this right, Office Communicator (probably 2007 R2 and later) implements support for the IMsoContactCard – so a Fluent UI approach might actually give us coverage in Outlook *and* Communicator. I don’t know how useful that really would be, but it *sounds* cool. Thinking as an end user, I’d find another tab on the Outlook Properties window more intuitive, but I’d also be extremely unforgiving if my Outlook user experience slowed down or destabilized. I don’t like the Context Menu approach that I seem to be left with in customizing the Fluent UI, but I can be optimistic that a more integrated approach will become apparent as my research continues – and in the meantime I’ll have a Fluent UI-compatible set of code to build on. All these articles I’m finding talk about these Contact Card customizations in terms of customizing the “Fluent UI”. I’m not sure, but I had believed that this Fluent UI was primarily introduced as a wrapping layer of menu/ribbon ‘cleanup’ of the Office UI that was long overdue by Office 2007. These references make it sound as if the Fluent UI is where all new UI improvements are “homed” in Outlook 2010. In Office 2010, the Office Fluent UI is fully customizable. This includes the ribbon, the Quick Access Toolbar, and the built-in context menus. By using the flexible XML-based markup and callbacks, you can create context menus by updating Open XML Format files or by using add-ins that are created in Microsoft Visual Studio. In Office 2010, you can customize built-in context menus just as you can the other components of the Ribbon UI. This XML-based context menu extensibility model is based on the familiar Ribbon extensibility model. This means that you can use the same XML markup and callbacks that you currently use to customize the Ribbon UI. Encouraging, but not specifically helpful other than a lot of hand-waving and empty promises. Having clear documentation on what the object model does is the critical piece, and all I’ve got here so far is a Context menu (which is hardly an intuitive UI approach). However, if that’s what I’ve got then it’ll have to do. Off to implement code based on Customizing the Context Menu of a Contact Card in Outlook 2010 and see how well that treats me.